A “major incident” has been declared by police after reports of an explosion in Leicester. At around 7.03pm, Leicestershire Fire and Rescue received calls from members of the public, who said they had heard a blast on Hinckley Road. A spokeswoman said six fire engines had been requested and that the incident is currently being treated as a search and rescue operation. East Midlands ambulance service said four people had been taken to Leicester Royal Infirmary following the incident. All four were in a critical condition. Pictures and video on social media show a shop on the street engulfed in flames, with the flat above completely collapsed. In the images, debris can be seen strewn across the road. In one video, people can be seen running to the scene while others attempt to move chunks of rubble outside the building as sirens blare in the background. She added that the affected property was a two floor building with a loft conversion that had suffered a “pancake collapse”. The shop, Western Park Store, which is sandwiched between TJ’s takeaway and Morgans bar, has a bus stop in front of it. It is to the west of the city centre. Kat Pattison, who lives nearby, told the Guardian her whole house shook. 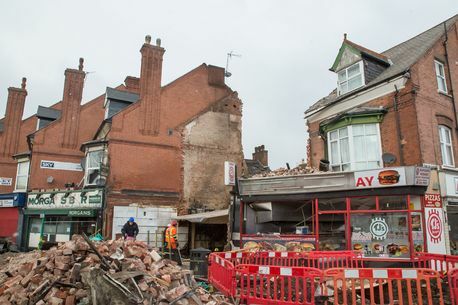 Four people have died after an explosion ripped through a shop and flat in Hinckley Road, Leicester, last night. The Mercury is at the scene and covering the story live. Updates will appear below. The blast tore apart Western Park stores, close to the junction with Westcotes Drive, at about 7pm. A massive blaze broke out at the site within a couple of minutes of the explosion, which rocked houses in nearby streets. Emergency services have been at the scene through the night. Leicestershire Police said this morning: "Four people are confirmed to have died in an explosion at a property in Leicester last night." The force added that four more people remain in hospital, one of whom has serious injuries. Hinckley Road, from its junction with Bolton Road to its junction with Woodville Road, is closed in both directions. Motorists are advised to avoid the area. Three men in their 30s have been arrested on suspicion of manslaughter after five people were killed in an explosion in Leicester on Sunday. Leicestershire police said the three men, from East Anglia, north-west England and the east Midlands, were being questioned by detectives. “Whilst we will not disclose further details at this stage, we stress that there remains no evidence that the events of Sunday night are in any way terrorist related,” the force said. The explosion happened at around 7pm on Hinckley Road, destroying the Polish supermarket Zabka and a two-storey home above it. A search and recovery operation was continuing on Wednesday, however police have said they do not expect to find any survivors. The remains of five people had been recovered from the wreckage but police said it could take some time before they were formally identified due to the scale of the destruction. I can't help thinking there's an awful lot they're not telling us? As usual! Have to agree with you Dutchman. Two men have been arrested by police investigating an explosion in Leicester that killed five people. The men, in their 30s and from East Anglia, have been arrested on suspicion of conspiracy to cause an explosion. Three members of the same family died when the shop and flat were destroyed on Sunday. Three other men, also in their 30s, were arrested on suspicion of manslaughter on Wednesday and continue to be questioned by detectives. The latest arrests are also on suspicion of offences under the Proceeds of Crime Act. Three men who were arrested following the Leicester explosion have today been charged with five counts of manslaughter and arson with intent to endanger life. The trio will be held in custody during the weekend and will appear before Leicester magistrates on Monday. The three men were arrested on Wednesday in connection with the explosion at a building in Hinckley Road on Sunday. Kurd is the owner of the shop which exploded and spoke with reporters after the blast. Two other men who were arrested yesterday, both from East Anglia, remain in police custody and continue to be questioned by detectives. A spokesperson for Leicestershire Police said: "Throughout this complex investigation we have been urging journalists and members of the public not to speculate about the cause of the explosion. "With three people now charged and due in court, it becomes even more important, for legal reasons, that this message is heeded. "A continuance of such ill-informed and speculative commentary threatens to jeopardise this investigation and serves only to cause further distress to the families of those killed and injured." If the police told us what they already know we wouldn't need to speculate! One of the web sites I use has uncovered quite a lot on one of the suspects. As you say Dutchman, in many ways the authorities don't help themselves. Three men - including one from Coventry - have appeared in court charged with manslaughter following the Leicester explosion which killed five people. The men are each accused of five counts of manslaughter and arson with intent to endanger life following the blast in Hinckley Road on Sunday, February 25. Hawkar Hassan, 32, of Eld Road, Foleshill, sat in the dock with his arms folded throughout the hearing at Leicester Magistrates’ Court today. The other two defendants are Aram Kurd, 33, from Hillary Place, Leicester, and Arkan Ali, 37, of Drake Close, Oldham. Kurd is the shopkeeper whose premises was destroyed in the blast. There were no applications for bail and all three were remanded back into custody ahead of an appearance at Leicester Crown Court on April 3 for a trial and preparation hearing. Two other men, both in their 30s and from East Anglia, who were arrested on Friday, have since been released under investigation. Police yesterday said they had made a sixth arrest in connection with the case. A man in his 40s, from East Anglia, has been arrested on suspicion of manslaughter and is currently in police custody being questioned by detectives. 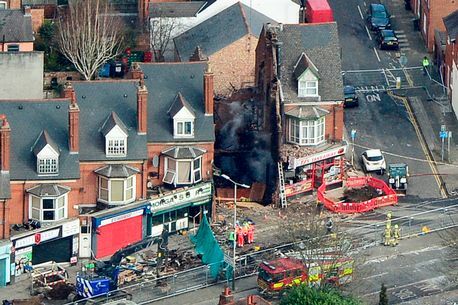 Police have made a further arrest over a shop explosion that left five people dead. The blast destroyed a Polish supermarket and a two-storey flat in Leicester on February 25 this year. Three people - including a man from Coventry - have already been charged over the fatal explosion and police have now stated that a further arrest has been made. A 35-year-old man, from the north-west of the country, was arrested on Wednesday on suspicion of conspiracy to commit arson. He has since been released on police bail while enquiries continue. And all these months later we're no wiser as to the motive for the crime! A Coventry man co-accused of causing a huge explosion at a shop which killed five people is now facing five counts of murder. Hawkar Hassan, 32, of Eld Road, Foleshill, had originally been charged with the manslaughter of five people who died in the blast at the Zabka Polish supermarket in Leicester on Sunday, February 25. His co-accused, Aram Kurd, 33 and Arkan Ali, 37, have also seen their manslaughter charges increased to murder. The defendants appeared at Leicester Crown Court today. David Herbert QC, prosecuting, applied to the court to add the new charges of murder in the light of the evidence available to the investigation. Although no pleas were entered, defence counsel indicated that not guilty pleas were likely to follow. At an earlier hearing at the city’s magistrates court, petrol was given as the alleged cause of the explosion. The three defendants, who were also originally charged with arson, recklessly endangering lives, were assisted by a Kurdish interpreter. Flanked by six custody officers in the dock, they spoke only to confirm their names. Ali is from Drake Close, Oldham and Kurd is of Hillary Place, Braunstone, Leicester. Ali was represented by defence counsel, James House QC, Hassan by Aisha Khan and Kurd by Daniel Oscroft. Judge Dean adjourned the case for a pre-trial review on October 18. There were no applications for bail and the defendants were remanded back into custody. A trial is due to take place in November.